Compared with open surgical procedures, laparoscopic repair of paraesophageal hernias (PEH) has been associated with a more rapid recovery, a shorter hospital stay, less pain, and fewer perioperative complications. Prosthetic mesh is routinely implanted during PEH repairs with the aim of mitigating hernia recurrence, but commonly used nonabsorbable materials may, over time, erode into the esophageal tissue and/or cause esophageal stenosis, fibrosis, dysphagia, and pain. “Biologic” prostheses, which are composed of human (cadaver) or animal tissue, provide a bioabsorbable alternative to the permanent presence of a foreign body, but these materials may have a limited shelf life, high cost, or require special preparation in the operating room (soaking, stretching). Biologic prostheses have also been reported to be associated with an increased risk of recurrence. A new option for PEH repairs is GORE® BIO-A® Tissue Reinforcement, a bioabsorbable material that is composed of a web of synthetic polymers. The web is similar to the extracellular matrix in biologic materials and undergoes hydrolytic degradation, leaving behind no material that should cause late complications. Since June 2009, I have used this product to repair 14 PEHs and to reinforce the hiatal repair of 31 Nissen fundoplications, with good results and no reported recurrences. Herein is described a histological analysis of a sample of the material that was obtained six months after implantation during a PEH repair. The patient was a 71-year-old woman who underwent laparoscopic PEH repair with Nissen fundoplication. There were no operative or postoperative complications. Postoperatively, the patient had both complete resolution of her reflux symptoms and increased exercise tolerance. However, six months later the patient was diagnosed with gallbladder disease and a laparoscopic cholecystectomy was performed. The patient consented to laparoscopic biopsy of the PEH repair site during the cholecystectomy. The histologic assessment of the repair-site specimen showed dense fibrocollagenous tissue with scattered clusters of lymphocytes and rare foreign-body giant cells. The middle region of the tissue was extensively vascular, with the vascularity bordered by fatty tissue. A few remnants of the prosthesis were present, surrounded or covered by fibrovascular tissue with fibroblasts. Foreign-body giant cells and histiocytes were adjacent to the remnants. There was no evidence of bacteria or mineralization. To my knowledge, this is the first report of a clinical “second look” at an implanted GORE® BIO-A® Tissue Reinforcement. Overall, the histologic study showed that the material was almost completely absorbed by six months and replaced by fibrovascular tissue, findings which indicated that the prosthesis had encouraged new tissue ingrowth and that a foreign body was no longer present. 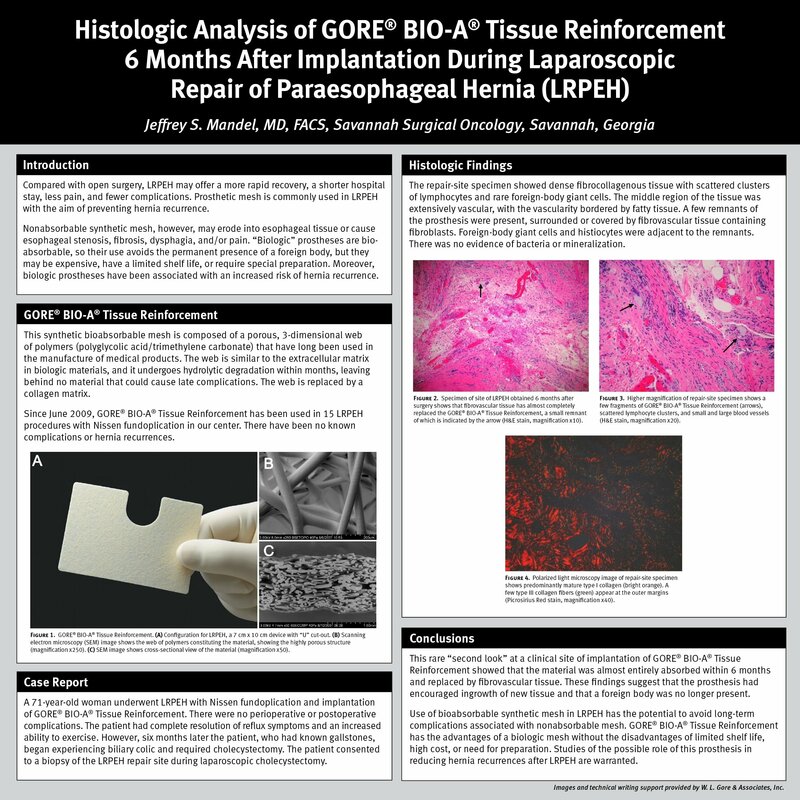 This case suggests that use of GORE® BIO-A® Tissue Reinforcement may avoid long-term complications associated with the use of nonabsorbable mesh for PEH repair. GORE® BIO-A® Tissue Reinforcement is a unique synthetic mesh in that its resorbability has the advantages of a biologic mesh without the disadvantages of limited shelf life, high cost, or need for preparation. Thus, further studies of the role of this prosthesis in reducing hernia recurrences after laparoscopic PEH repair are warranted.